The St. Charles Cyclones U18 Divison 1 team of the St. Charles Soccer Club, recently won the 2007 U18 Division 1 Louisiana Soccer Association State Championship, in Alexandria the weekend of April 28. The Cyclones had a terrific season as they concluded their regular season play by winning the U19 bracket championship in the St. Charles Plantation Cup. 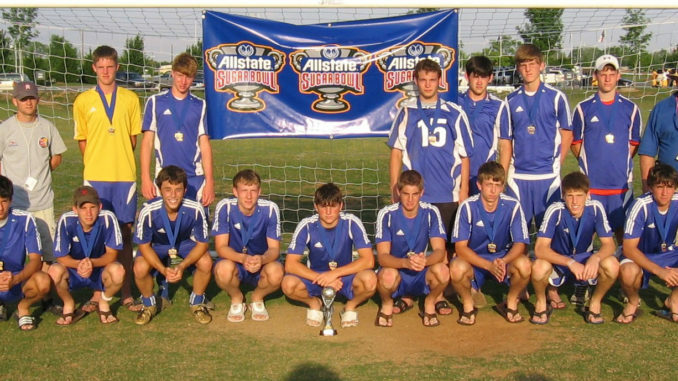 With a focused goal of winning the 2007 U18 LSA State Cup Championship the team arrived in Alexandria a few weeks later with a very business-like attitude. The Cyclones won their first two games on Saturday and finished the day as the only undefeated team in the bracket. The first game on Sunday morning resulted in a win (game 3) and set up a must win for the final game. Knowing that a victory in the final game would mean a State Championship, the Cyclones team came out with their hair on fire! By the middle of the second half, and leading 4-0, the outcome was inevitable. When the final whistle blew, the St. Charles Cyclones had become the 2007 D1 U18 LSA State Champions. Their play over the weekend was a true team effort by each and every player. This year’s team is made up of players from Hahnville High School, Destrehan High School, and St. Charles Catholic High School. The Cyclones have had much success over the past few years, and have come very close to winning state in the past, but this was their first state title. The team members from left to right: (front row) Justin Aubert, Paul Finn, Devin Samaha, Nick Caropino, Justin Breaux, Zach Landry, Matt Ballard, Chris Ilski, Peter Lambert-Oswald, (back row) Trainer Jarrad Larousse, DJ Winkler, Will Conwell, Evan Coffman, Zach Matus, Mike Webre, Tim Hager, Asst Coach Bill Ballard. Not pictured are: Coach Darryl Samaha, Drew Samaha, and Jake Hackett.